" I would find it impossible to nominate one person as all of the carers that come into my mother in law are all very nice friendly caring people. I should congratulate your company on having such excellent staff. It puts our mind at rest that we know they always turn up on time and a treat her so well." " The carers are very good at carrying out their duties and keep me informed at all times about my wife's condition. They also look after me, when the bad weather was here they offered to take our dog out so I didn't have to go out. They are a smashing bunch of girls. " 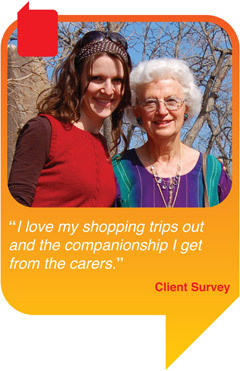 " I love my shopping trips out and the companionship I get from the carers. " " Thank you for providing me with care during my recovery from an illness, I am now able to look after myself. Thank you to all of the carers for making me feel comfortable, I couldn't fault any of them. " " After much thought I cannot just nominate one carer alone, because they are all worthy of nomination. " " I give the care 10/10 the level of service is excellent. We have had another agency previously and were worried when we had to change. On reflection it was the best thing that has happened to us. " " Just when we were beginning to fall apart, help arrived in the form of Meadow Lodge Home Care Services, they left me to just love and care for him as I had before. " " All the girls deserve an award. " " All the carers are lovely and know everything about me. " " I just wanted to write to you to say a huge thank you to all the carers who looked after my mother over the last eighteen months. They were such a dedicated team and so kind to her. We both felt that they were an extension of our family yet at the same time professional. " " I would like to convey my thanks to your carer for the support that she gave to my client during the period at home with 24 hour cover. The family of my client are highly impressed with the care that continues to be delivered by the Tadcaster team carers. Please pass on my comments to all involved for the excellent work they have done and continue to do. " " All the carers coming here are excellent. " " I was over the moon when I got Meadow Lodge Home Care Services back after being in hospital. " " I am writing to thank you for putting a call into our client when we were unable to gain access due to the inclement weather. " " I am writing to bring to your attention the outstanding commitment that Meadow Lodge Home Care Services have made in providing care for my client during the prolonged period of severe weather. My client lives in a rural isolated position with treacherous roads, yet they managed to provide care to a high and consistent standard. "